Here at Carpetsure we offer our customers a one-stop solution for all of their cleaning needs. Carpetsure are an independent, local, family run carpet and upholstery cleaning company, who guarantee’s the highest standards. Our attention to detail, commitment to our customers, and consideration for your home and soft furnishings is second to none. We offer a polite and personal service to all of our customers and professional workmanship in everything we do. Carpetsure have always believed in traditional values. 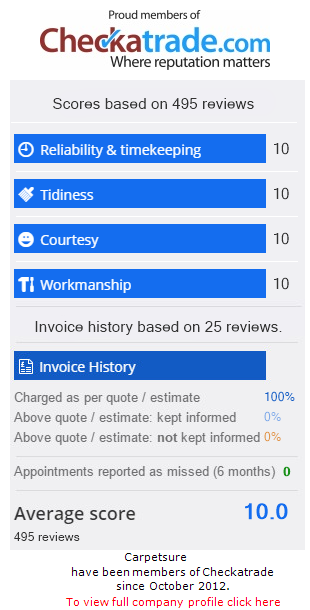 We are passionate about what we do and pride ourselves on our professionalism that is why 70% of our work comes from repeat customers and referrals. We believe in giving our customers the most advanced but safest service available, by insuring most of the products we use are ECO FRIENDLY. This means they are safe for you, your children and pets. Carpetsure have under gone the most advanced training programs in the industry and it doesn’t stop there. We are fully vetted by Trading Standards, hold a current CRB certificate, proud member of Checkatrade and TACCA (The Approved Carpet Cleaners Association) registered. Carpetsure hold full public liability insurance (including treatment risk), which means we are fully covered not only within your home, or business, but also on the items, we are working on. We are located in Poole, Dorset and serve all of the surrounding areas. Whether you would like to book in advance or need a last minute appointment we will always do our upmost to accommodate you.